President Edgar Lungu has handed over 55 police houses in Luanshya district, on the Copperbelt Province. Speaking during the event, the President said there is need to restore the respect and dignity for the Zambia Police personnel in the country including all other civil servants. 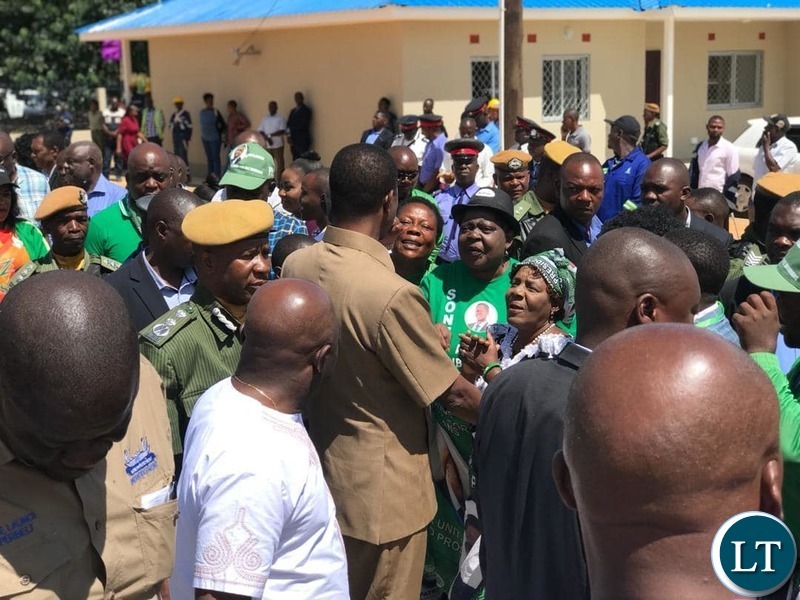 President Lungu noted that since 1973, there has not been any notable transformation towards improving the welfare of the police department. He said government has since committed itself to construct 12,000 housing units for the police and will ensure that the move is fulfilled so that no one remains behind. 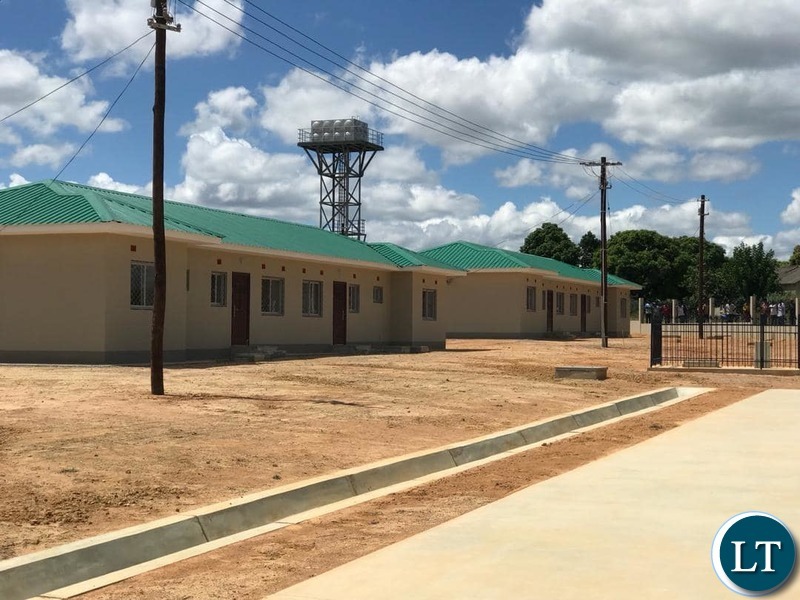 President Lungu added that the uniformed officers are not the only ones to benefit from the housing project but everybody that works under the Ministry of Home Affairs, including Immigration department, Drug Enforcement Commission and Prisons, among others. And the Head of State has stated that government remains committed to fulfilling the promises that were made to the people from the time the Patriotic Front came into power. President Lungu said more projects will be implemented in Luanshya district including construction and rehabilitation of Township roads. The President has since urged Members of Parliament and all Ministers to continue pushing for developmental projects, to be implemented in their respective areas in order to fulfill the promises made to the people and also improve on service delivery. The Head of State also called on all Zambians to hold government accountable and ensure that they deliver on what was promised. And Minister of Home Affairs Stephen Kampyongo says the new houses will motivate the police force to maintain high levels of morale as they carry out their duties. 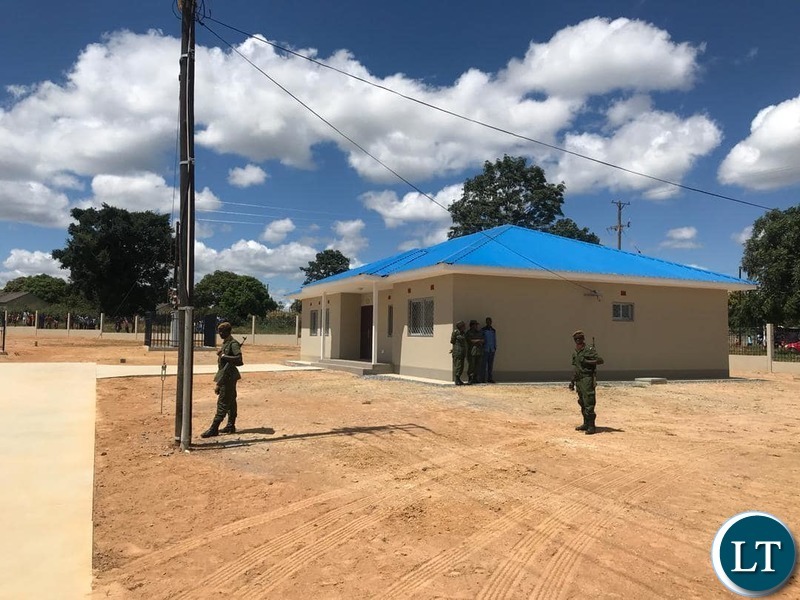 Government in July 2018 embarked on the construction of 55 low and medium cost police housing units in Luanshya, for Luanshya Central Levy Chito Camp and Mpatamatu costing over 2 Million Kwacha. 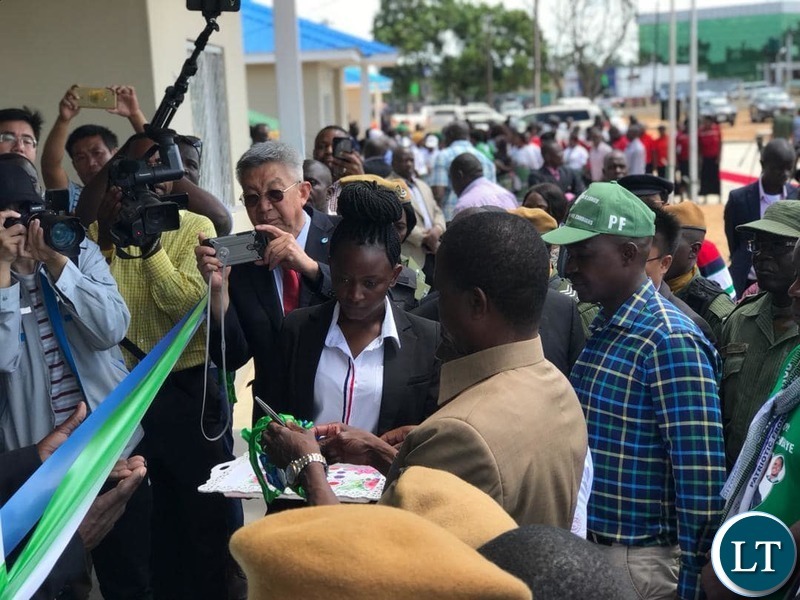 President Lungu handing over 55 police houses in Luanshya district, on the Copperbelt Province. “ Black Mountain” in Luanshya handed over to unemployed youths in the district. These handovers should be done by DCs MPs and mayors not the President. We are giving the SHlT hole opposition Under 5 free ammunition to attack us. If the Under 5 Paradise boy never sold our mines we would be better off today. No doubt what he did together with the FTJ administration and a few other core crooks to our mines is messless, selfish and unforgivable. Kopala will never forgive double h and his line of defendants. At least CK might blame his loss on the double h factor. Peace to kapalas. Teach seshekeans how not to do politics. Ubuloshi, bupompwe nobunkalwe. Shameless bloodsheders. Why would you wanna bloodshed to win an election? Who does that? We saw hh addressing thousands of roan residents with CK …heard no such insults …or it must haven been some of PF kaponya thugs hurling insults since lungu banned them from violence…..
How about good job ECL instead of tired complaints and insults when you have never done anything to help your community ubupuba like Kambwili! Lungu has got ‘akasaka Kandalama’. He owns all this stuff he is giving out! But the question is why Luanshya and why now. I Luanshya anywhere near Roan? Ba Lungu Chipuba! The guy will be arrested! You wonder how much is being spent on each unit via their crooked Chink AVIC contractors, no wonder we are in debt…we are simply going backwards instead of encouraging empowerment the reason FTJ sold those council houses in the first place increase their salaries ….I mean who facility manages these homes. Knowing the wives of these officers those front landings smeared with unsightly red polish!! *…..those front landings will be smeared…. Smart campaign strategy, if I may add. That’s what I call taking advantage of the advantages when you have the power of incumbency. May democracy win, may the best candidate win. Which mine boss?why not arresting him than crying all the time? All mines which used to be ZCCM owned and now in the hands of foreigners. (HH) sold them and Roan voters will show him tomorrow. (HH) is a useless lDlOTIC failure in politics. 13 years since 2006 and he still has no MPs on standby in the Copperbelt? He messed up people’s lives. He is a constant reminder of the chilling poverty printed all over kopala. No matter what a double h sympathizer would say, people in that province have real excruciating experiences of what the name double h means – a living nightmare, a mocking personality and an unrepentant shameless conman. I lived on the Kopala belt 4 years under double K, 4 years under FTJ, 4 months under LPM, 2 months under RB and 1month under MCS. I hope to go there and do maybe 2-3 months under ECL. We will hear the verdict when they cast that vote. Kudos HH will send you to your early grave he seems to send ur BP high every time that story is a tired one it will never wash try another line. Was this a PF project or government project too many cadres at this event! Luanshya DC, Mayor even that clown Kampyongo should have handed over the houses to the officers. Not a whole president. Okay,politics aside,PF Govnt have tried so hard to develop Zambia since 2011.If MMD did what PF has done in those 20 yrs which they ruled Zambia,our country could have reached higher levels in terms of development by now.Its a pity that we wasted 20 solid years under MMD.After PF’s tenure,Zambia will be a better place to live in.Several new houses,clinics,schools,hospitals,universities,roads,public office buildings,etc have been built across Zambia.THIS IS VERY NICE INDEED!! !PLEASE KEEP IT UP PF GOVNT AND WE WILL CONTINUE REWARDING YOU WITH VOTES!!! And how much do you owe ? What is your GDP ? Good to see ZP officers get to live decently what i don’t like is Lungu’s approach of politicking/electioneering 1st and development projects come 2nd. Mr. Kudos, are aware that president Lungu was part of those who participated i privatization? Regardless of many accusations of stealing by there critics,pf has sonta apowabomba everywhere while mmd have non even in its 20years tenure.lwanshya voters wud prefer pf to upnd coz of hh”s conection with the sale of mines which brought untold misery to kopala.a thief who share with others is beter than a thief who doesnt share with others. About time too ! It would be nice to see more professionalism and less corruption among our officers with this elevation in status. They shouldn’t feel indebted to the government by even more harassment of opposition. Your friends Kagame and Kenyatta are handing over manufacturing plants in provinces as you for you its police posts and houses so that they can continue to oppress Zambians. it’s not pf or lungu’s money that was used to construct those houses or any other projects in Zambia. it’s tax payer’s money. it’s Zambia’s money. Zambia doesn’t equal pf. wake up! are you guys that dumb or you get small moneys from them fools? why are you so lazy to think?